‘Vicious’ was the title of Rick Owens’ latest offering – an appropriate term considering his show opened to the uproar of an Estonian death metal band. As the sounds reverberated through the show space – an industrial sports hall in Paris - it soon became clear that this wasn’t just background noise for Owens, but all part of the performance. His army of dark urban warriors walked through the space, weaving past the band (and even an upside drummer on a turning podium) to reveal an androgynous collection of leathers, mesh and cut-out garments. Rick’s boys were as otherworldly as ever, some with skin heads and others had long hair – all cast by Noah Shelly. As the final looks appeared on the runway, three members of the band – a former Eurovision contestant known as Winny Puhh – were strapped into harnesses and left hanging on the ceiling, squirming around before eventually silence hit and they were left hanging like dead carcasses. Estonian is like a lunar language, it’s so alien, so wonderful - especially the way he screeches it. I was hoping it would be alien. I saw them on the internet, they were on the last Eurovision which I love, they’re from Estonia, and they’re just awesome aren’t they? Rick Owens: Who’s that band? Rick Owens: Was it otherworldly? Rick Owens: I was hoping it would be. Estonian is like a lunar language, it’s so alien, so wonderful - especially the way he screeches it. I was hoping it would be alien. I saw them on the internet, they were on the last Eurovision which I love, they’re from Estonia, and they’re just awesome aren’t they? DD: Yes, what are they called? Rick Owens: Winny Puhh. I asked them, “why did you name yourselves Winny Puhh?” And they said it was the dumbest thing they could come up with and I totally relate to that. When I got my first tattoo a friend of mine told me, “just a word of advice, it can never be too big or too dumb,” and I said you know what, “dumb lasts forever,” it’s true and it’s still true today. DD: How did you want to connect the performance and the collection? 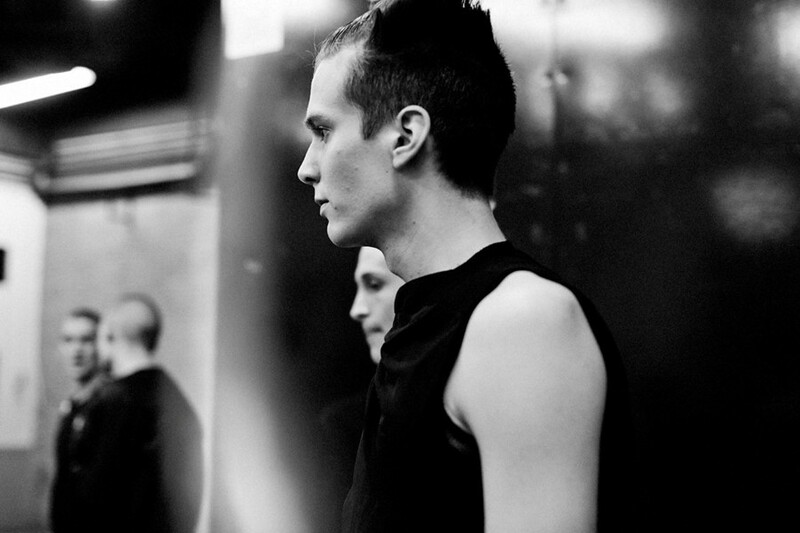 Rick Owens: What I love about them is that they have a cheerful aggression. They also have this wonderful over the top limitlessness – there are just no limits in their performance. I love that kind of aggression, it’s a friendly aggression. Sometimes my shows and clothes can seem kind of aggressive, but it’s a cheerful aggression, it isn’t as menacing as it looks. We all love a little bit of menace and I indulge myself with it a little bit.